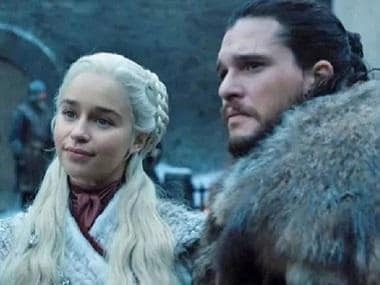 The final season of HBO's record breaking fantasy series Game of Thrones has finally begun, with the first episode being simulcast at 6:30 am in India. The makers have now unveiled a nail-biting promo from the second episode, and from the looks of it, it seems to packed with as much punch as the first episode. In the 50-second-long teaser, Daenerys Targaryen confronts Jaime Lannister, the murderer of her father "Mad King" Aerys Targaryen, for the first time. "When I was a child, my brother would tell me a bedtime story about the man who murdered our father, about all the things we would do to that man," Dany tells the Kingslayer in the Great Hall of Winterfell. Seated beside is Bran Stark, who Jaime pushed out of the high window of an abandoned tower in Winterfell in the first-ever episode of Game of Thrones. Dany meets Lady of Winterfell, Sansa Stark, and says that she should never have trusted Cersei. Sansa replies to her chiding in a stone-cold voice, "You shouldn't have either." Arya Stark's voice is heard echoing ominously in the background, "Death, it's got so many faces; I look forward to seeing this one." Tormund is too seen briefly, when he arrives at Winterfell to warn Jon of the Night King's approach.